Great news to start the day! I read on Umezz's site that two new Makoto-chan shirts are being released by Uniqlo today, as part of their unending manga t-shirt deluge. Like the first Kazuo Umezu shirt, these are part of Uniqlo's Shonen Sunday Magazine's 50th anniversary celebration. You can see all the shirts to date here. I wonder how soon they'll make it to the Uniqlo in New York? 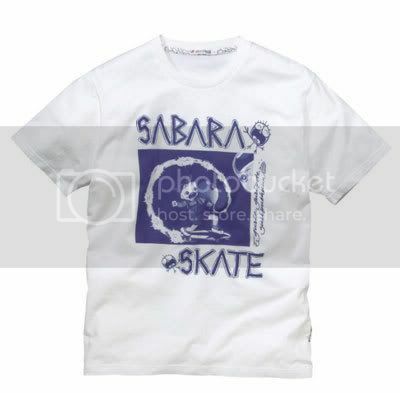 That would be tight to get a SABARA SKATE shirt this weekend when I'm in town for MoCCA! A more interesting Gwashi! 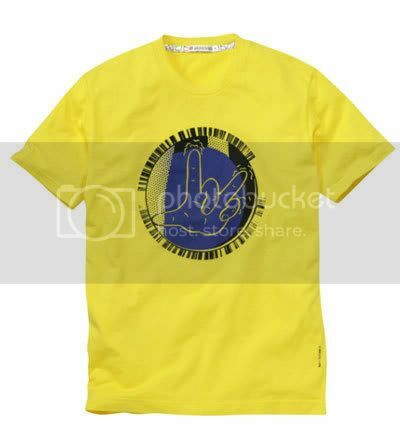 shirt, with the purple hand on yellow. WHOA! A totally radical skater shirt, with Boku-chan on a board. Insane. I WANT. It took a couple weeks to get the last Shonen Sunday shirts in the NYC store. Last time I was there, though, they'd really started to go nuts with the manga-related products (the storefront even featured giant cutouts of Conan and Lum, and the mezzanine was wallpapered in manga). So if they're still doing that, maybe their turnaround time is shorter. I miss being near their flagship US store, but it's probably for the best - less temptation to buy so many shirts! sigh. must be nice to go to NYC. must be nice to shop at uniqlo. must be nice to be ryan sands!